Part of the allure of any city is its ability to captivate with hidden gems, dimly lit alleyways, breathtaking boulevards, and, perhaps most important of all, great places to eat and drink. London delivers on this allure in spades. The imbibing culture of England’s capital ranges from world-class mixology to centuries-old pubs serving room temperature cask beer and mediocre fish and chips. And around any given corner, you’re greeted with regularly rotating art installations and lonely Banksy graffiti in the strangest of places. 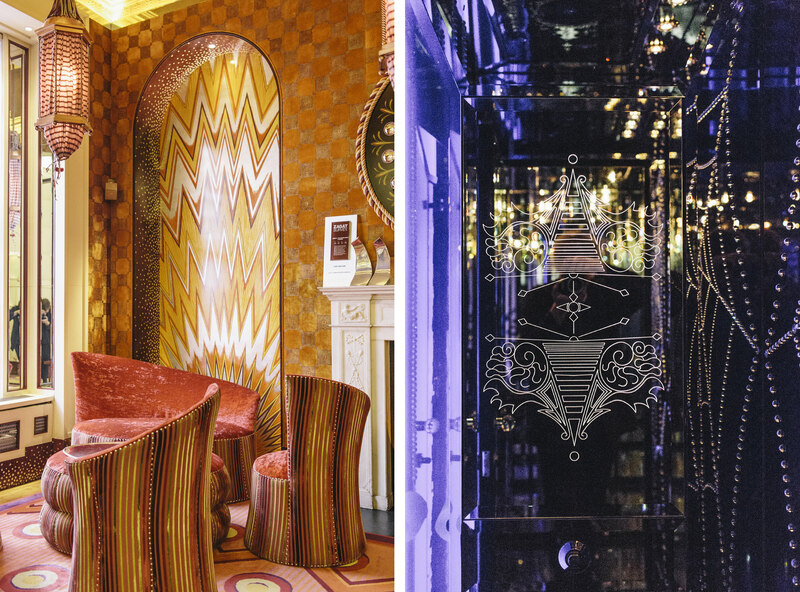 The most notable marriage of these pieces of London is city-bar-meets-art-installation, Sketch. Located in Mayfair, the multiple restaurant and bar is a wonder to take in (both aesthetically and prandially). The whole building is an immersive experiment of mood, texture, and art. Since its opening in 2002, owner Mourad Mazouz has focused on making the environment a living, breathing representation of art. Nothing is off limits. During Classfare’s most recent landing in London, Sketch was hosting a short term floral art installation throughout the whole of the grounds. 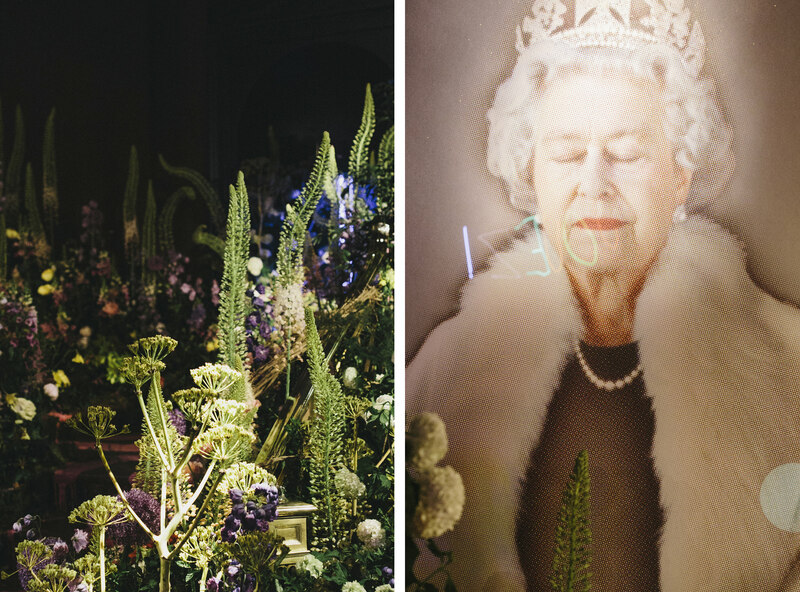 Comprised of concoctions from The Flower Appreciation Society, By Appointment Only Design, Carly Rogers Flowers, and JamJar Flowers, the draw of the English countryside was brought indoors, mesmerizing the senses. Hallways were transformed into secret gardens, ceilings converted to the shaded canopies of the meadow, and the large, white, stoic dome turned into an overgrown bog. The aroma hits you the moment you enter the door, and clings to your clothing after you finish a final Pimm’s. Amidst it’s captivating environment are three restaurants and one of the most unique bars in the world. The crown jewel is the exclusive (and expensive) Lecture Room. The two Michelin star restaurant is a fine, British-classy environment adorned with rich, red-toned carpets accented with golden walls and immaculately set with white cloth tables. This is tasting-menu dining at its finest. For the right person who values both food and luxury, it’s a great fit. Below and right off the street entrance is a magical decoupage forest called the Glade. The well worn wicker furniture invites you to settle in for a relaxed afternoon tea or casual dinner. It’s worth a quick drink and a long stare at the walls, taking in the care and time it took to lay each piece of paper by hand. Sitting between the two restaurants is the third installation: the Gallery. 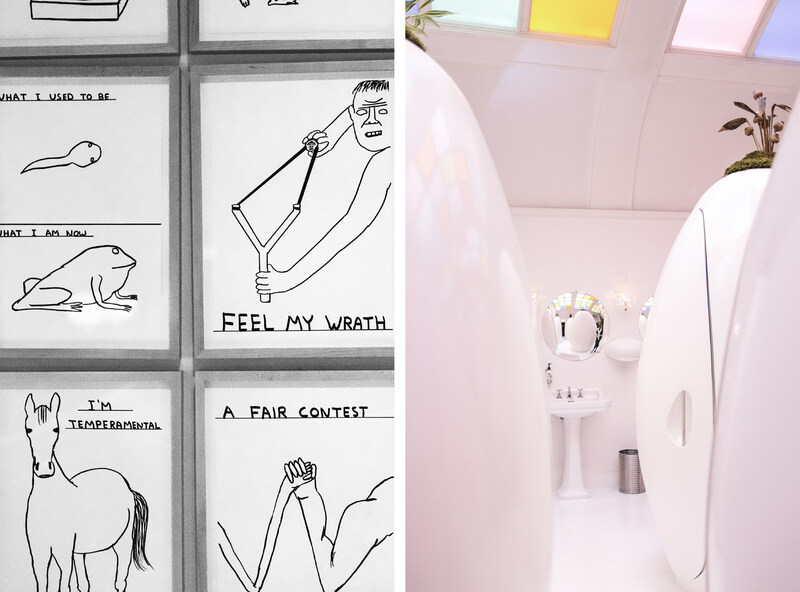 The restaurant features the fascinating and thought provoking art of David Shrigley. 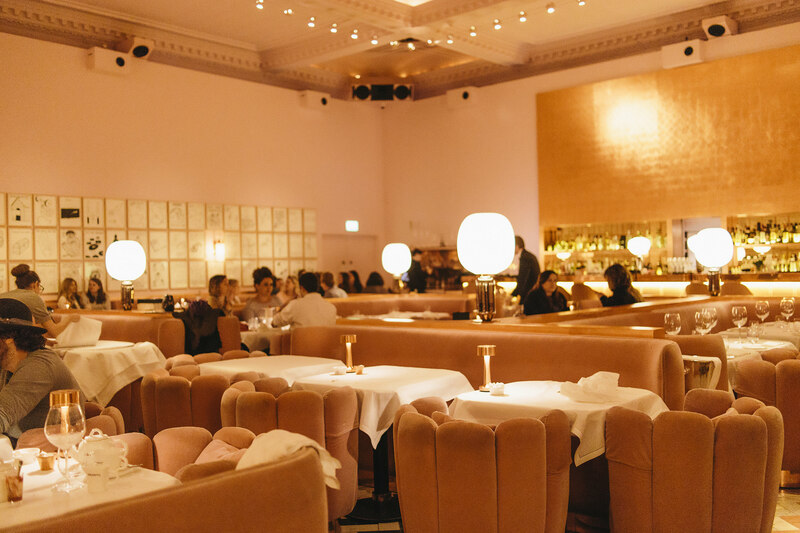 The setting of the Gallery (also a Michelin star award winner) is clean and dusty pink, and it blurs the line between meal and gallery intentionally yet unobtrusively. Perhaps the most novel (and the place we find ourselves night after night) is the modern, Jetsons-esque East Bar. From the outside, the East Bar looks like a shiny white dome, stark and clean. Inside you’ll find a circular sunken bar that’s lit up from the floor with dark, cozy lounge furniture surrounding the bartop. The walls and ceiling are covered from edge to edge with an intricate pencil drawing that captivates every time. On most nights, the crowd is energetic, and the music provides the perfect dose of club-vibes. Surrounding the dome are two circular staircases that lead to one-person bathrooms in the form of gently lit pink and blue eggs (his and hers). The eggs crack open, you step in, and you’re soothed with the sounds of old tapes of NASA launches. A bit crass. Quite hilatious. And altogether perfect. So, if you have a night in London, carve out the time for at least one of these unique experiences. There’s really something here for everyone. 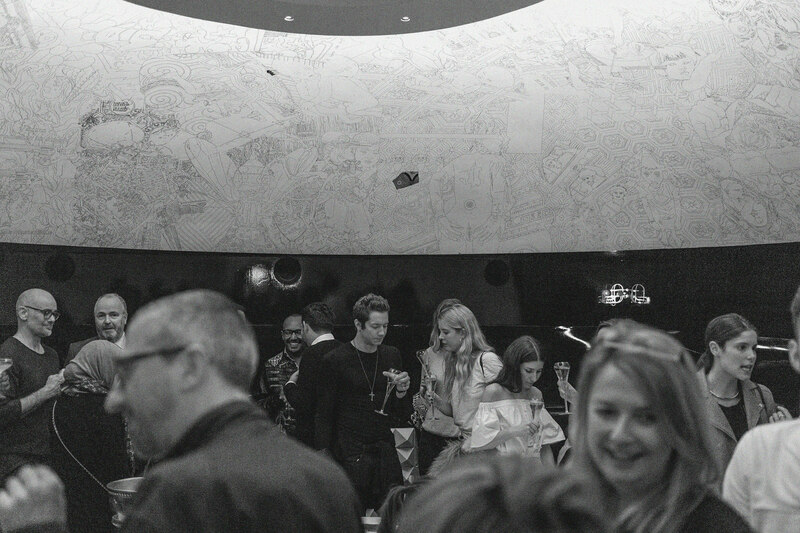 Whether you’re looking for an art gallery, fine dining, a fun bar scene, or simply the best place to take a piss in all of London, Sketch is ready and waiting.